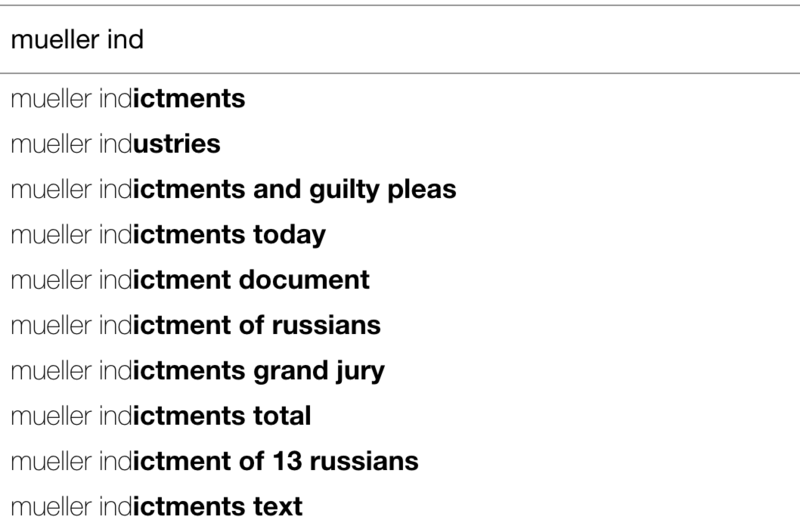 Using either "Trump" or "Mueller" as the subject, the following word "indictment" was not suggested even after spelling out most of it. 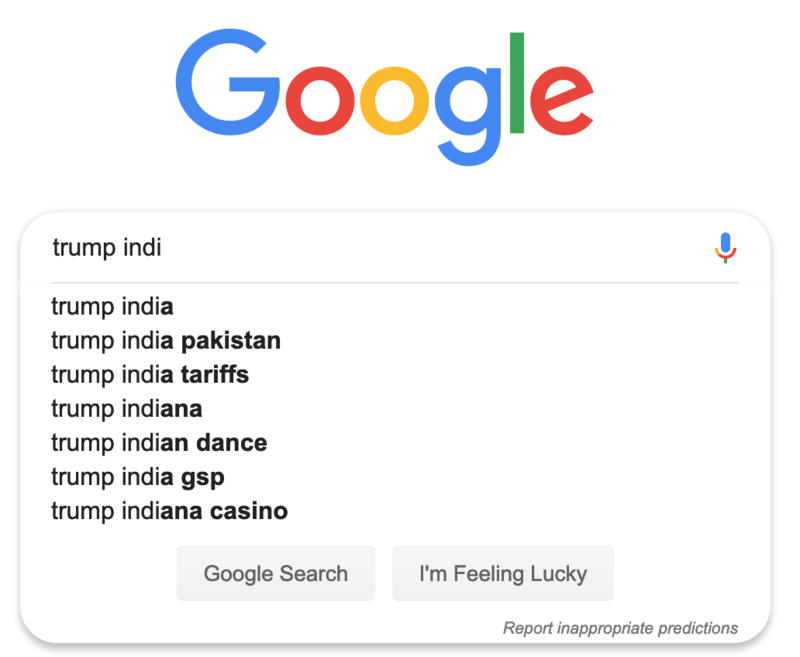 For example, putting "Trump indi" into Google’s search bar does not lead to "Trump indictment" but rather to "Trump India," "Trump India Pakistan," Trump India tariffs," and "Trump Indiana." "As a professional data scientist with at least some expertise relating to searches and profiling, I can say with near certainty that Google should have pushed me news stories relating to this and yet I had to search on my own to find the actual results of the report," a tech industry source told the Free Beacon. 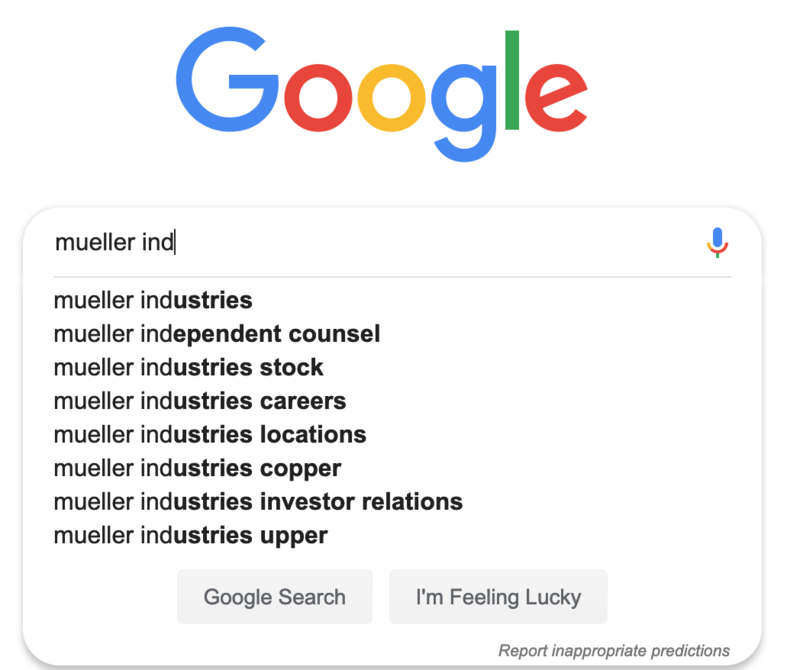 As users spell out "indictments," Google offered highly unusual search options besides "indictments." One top suggestion was "Trump indicator," which leads to pocket-sized playing dice for pinocle or bridge. On Monday a Google spokesman, Danny Sullivan, tweeted a response to the Free Beacon‘s article, saying searches that could be seen as "denigrating" may not have autocomplete predictions appear. Sullivan's link leads to a Google blog explaining that sexually explicit, racist, violent, or dangerous predictions are kept from appearing on Google search. Nowhere does this blog say Google excludes search predictions that "might be construed as denigrating," and it does not provide an explanation for why news of Trump being exonerated would run afoul of Google's search predictor. Google was previously accused of pushing positive stories about Hillary Clinton during the 2016 election. 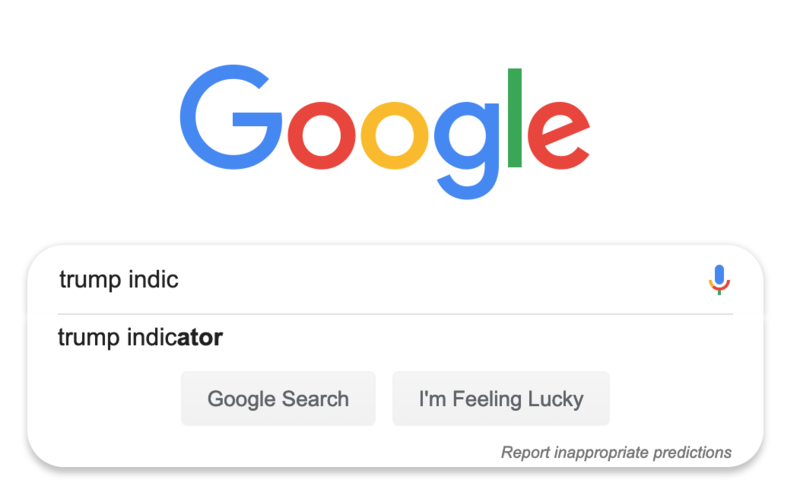 Google CEO Sundar Pichai has denied this kind of bias occurs in its search results, saying so repeatedly in a congressional hearing last year. Democrats, however, seemed to undermine Pichai’s message by arguing in that hearing that Google is free to suppress conservatives in its search results if it so desires. 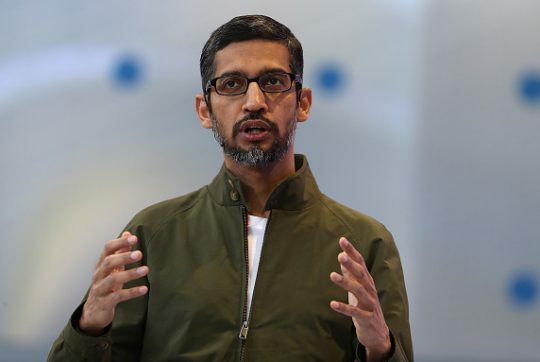 Pichai said such suppression of different views would violate the company’s "core principles," although an executive was caught emailing about making sure Google services helped Hillary Clinton in 2016. The company's fidelity to principles of free expression has also come under scrutiny as it has continued to work with Xi Jinping's autocratic regime in China. Because of severe free speech restrictions in that country, Google had been developing a special search engine "Dragonfly" that would block topics disapproved by the regime, including history about China and the Communist Party. Dragonfly was put on hold after it spawned an outcry against Google, but employees have expressed concern that it's being developed in secret. Domestically, the Silicon Valley giant is also dealing with pressure to have its products more strictly regulated. Democratic presidential candidate and Massachusetts senator Elizabeth Warren (D.) has called for breaking up major tech companies on anti-trust grounds. Updated 4:10 p.m.: This article was updated with a response by Google's Danny Sullivan. This entry was posted in Politics and tagged Donald Trump, Google, Media, Robert Mueller, Technology. Bookmark the permalink.